Generous arm width and elegant skirted style are hallmarks of the Charleston Collection. The Charleston Collection from NorthCape International has been updated in a new resin finish. Now warehoused in the Chicago-based company’s popular Willow Round Weave, Charleston is a perennial favorite that dealers will want to rediscover. The generous arm width and elegant skirted style are hallmarks of this collection, which has been one of NorthCape’s best sellers. Quick-ship CushNow options are available for this group in 24 of our NorthCape’s most popular Sunbrella fabrics, shipping in 10 business days or less. Customers looking for style, comfort, and value on the showroom floor will find what they are looking for. The Bainbridge Collection, also from NorthCape International (pictured bottom left), features a modern look with a transitional feel. The Collection communicates laid-back style in a stunning Willow Thick Weave HDPE resin over a commercial-grade aluminum frame. 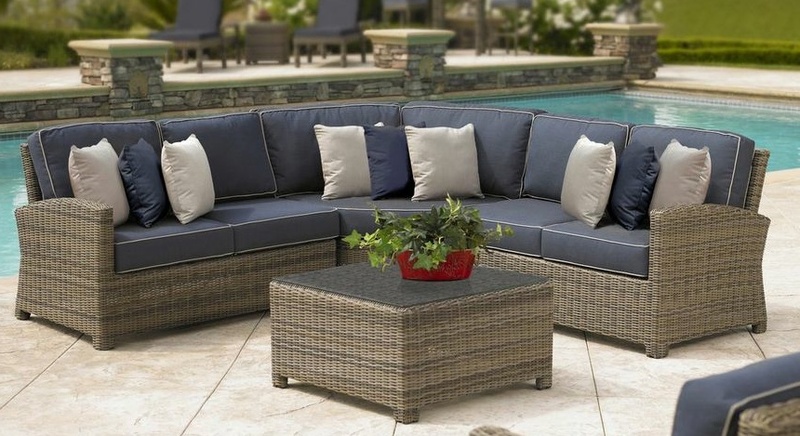 A full line of add-on pieces are available to help tie together any backyard space. Quick-ship CushNow options are available for this group in four Sunbrella fabric combinations. Cushions feature premium fill for extended bounce-back and indestructible Tenara thread. NorthCape offers five distribution points, as well as a wide range of logistical options, including direct import, cross-dock and consolidation programs. The company is able to keep lead times and freight costs to a minimum. By adding two domestic sewing manufacturing facilities, as well as a comprehensive cushion and pillow program, customers have more options, flexibility, and a greater return on investment.